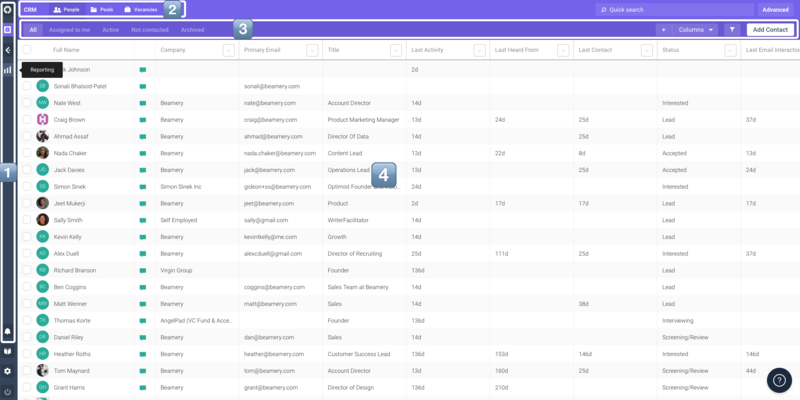 Introducing Beamery Search Assist, the most flexible candidate search experience powered by Behavioural Boolean. Identify talent based on their characteristics and interactions faster, reducing the time to find the relevant candidates for your business. Below is what’s included in Search Assist. Preferred locations lists the places the candidate is happy to work, found in the profile overview and as a filterable field. You can set the candidate’s preferred location using country, city, street and zip code from a predefined list, ensuring this data is structured and consistent. 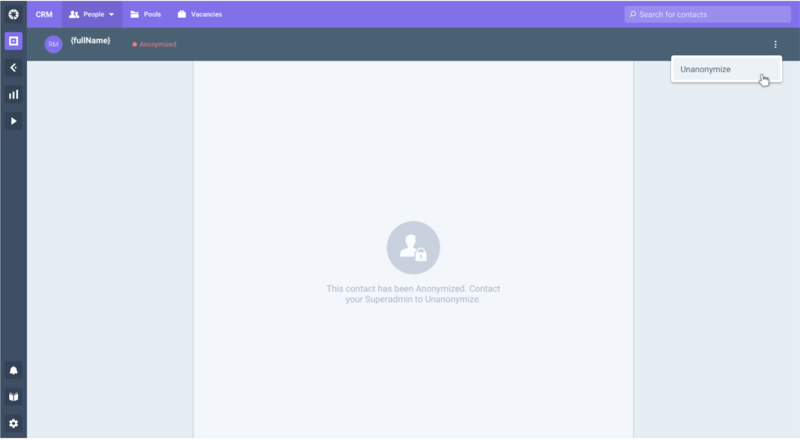 Find the right candidates rapidly, with true Boolean search and new filters, including radius search, vacancy stage, dates added to vacancies and pools, past companies, and who created and sourced the candidates. 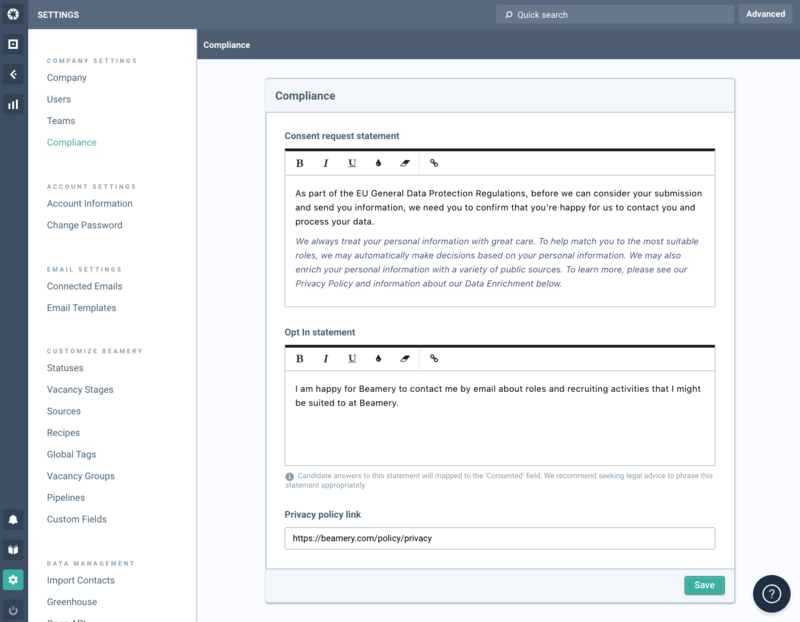 Repeat Recipes make it even more time-efficient for Recruiters and Sourcers to automate repetitive tasks. 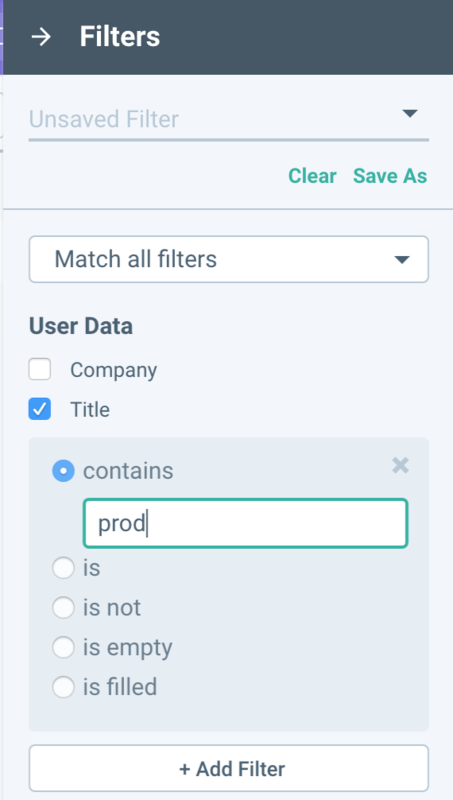 Now only a single repeatable Recipe is required to automate the same action each time a candidate matches a set of filters. 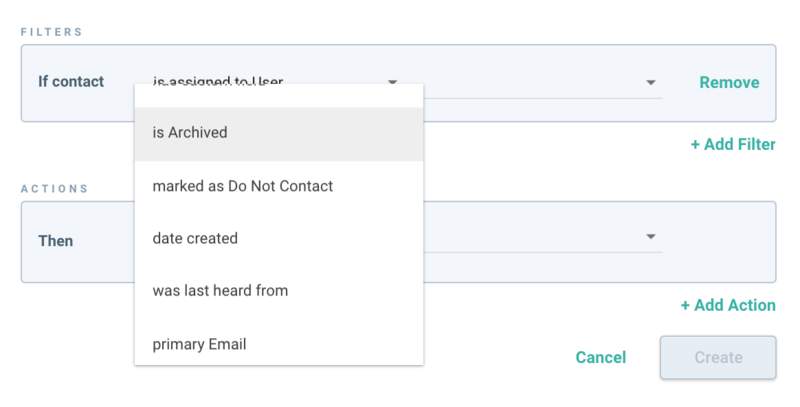 Automatically re-add candidates to pools, update statuses as candidates move through consecutive vacancies, and re-assign them to users. 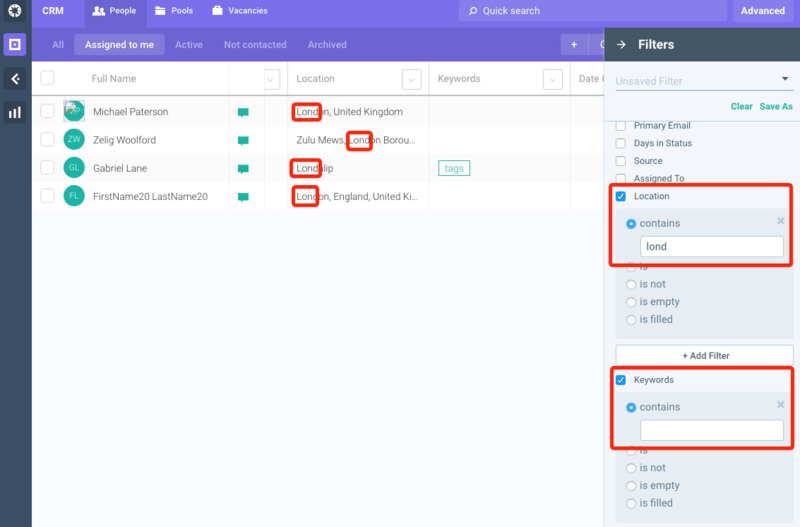 Use new Recipe actions to automatically add keywords, un-tag candidates, and remove them from pools, vacancies and campaigns. 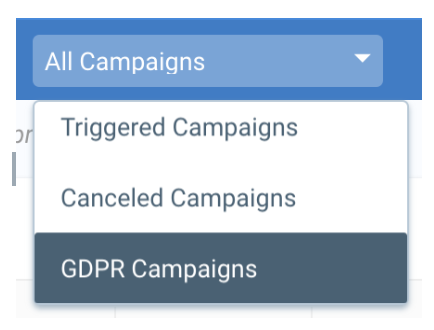 Manage which candidates should only be messaged directly rather than included in campaigns, by automatically marking them as ‘Do not campaign’ / ‘OK to campaign’. Get a holistic view of the time of communication with candidates. Now, adding notes from a candidate profile (e.g. 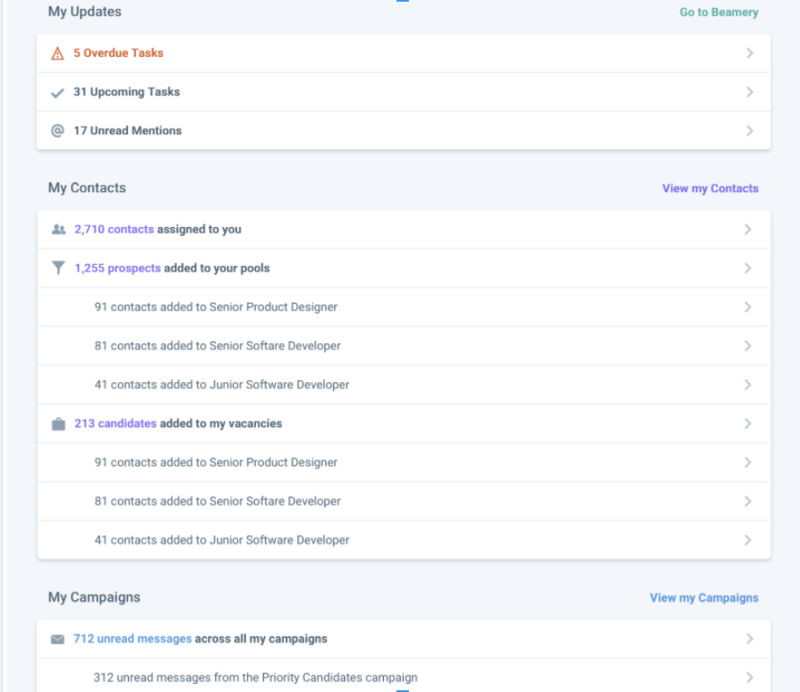 Call, InMail) updates the ‘Last Heard From’ and ‘Last Contacted’ times, so you can track the times of inbound and outbound communication beyond Beamery messages, then segment, engage with and automate actions with more relevance and rigour. 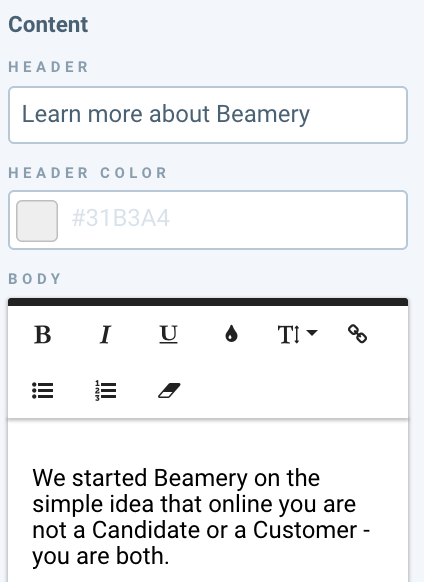 Note: All features aside from Repeat Recipes are automatically available in Beamery. The Repeat Recipes functionality comes at an additional cost. 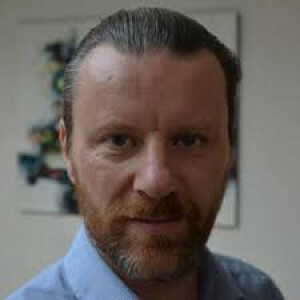 Please contact your Customer Success Manager for further details and pricing. Find further details on all Search Assist features here. 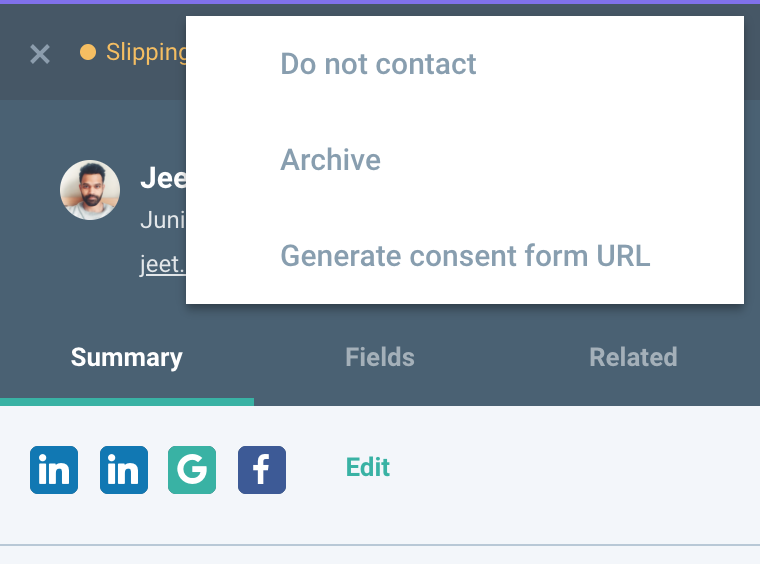 This update to Forms allows users to select which fields appear on a form and which fields are 'required'. This means you can collect critical information where necessary (e.g. CVs), and use Forms in a wider range of situations (e.g. to collect candidate emails at graduate events where professional information is not relevant). Then set particular fields as having a 'required' answer from the toggle on the right. 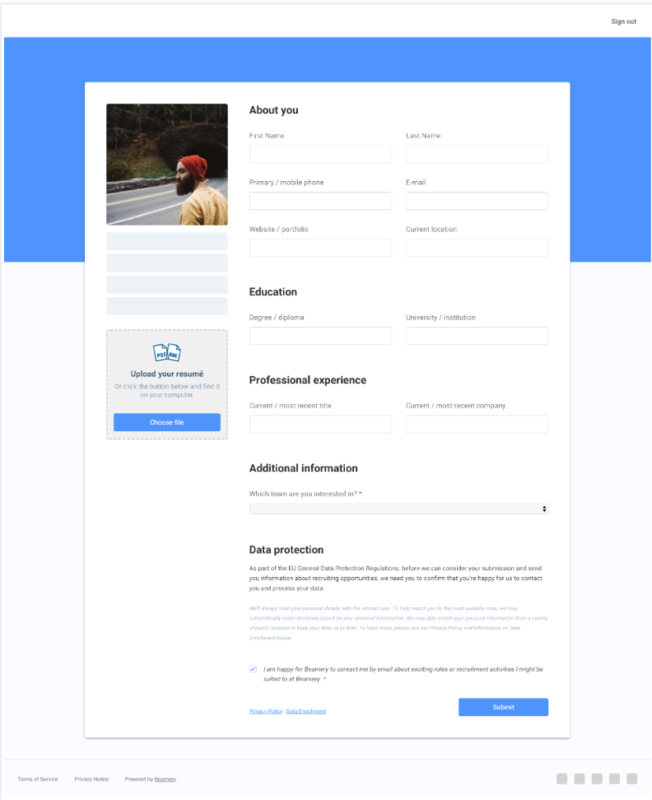 By default, phone number and professional experience will be marked as required fields, as per the original Form Builder experience. 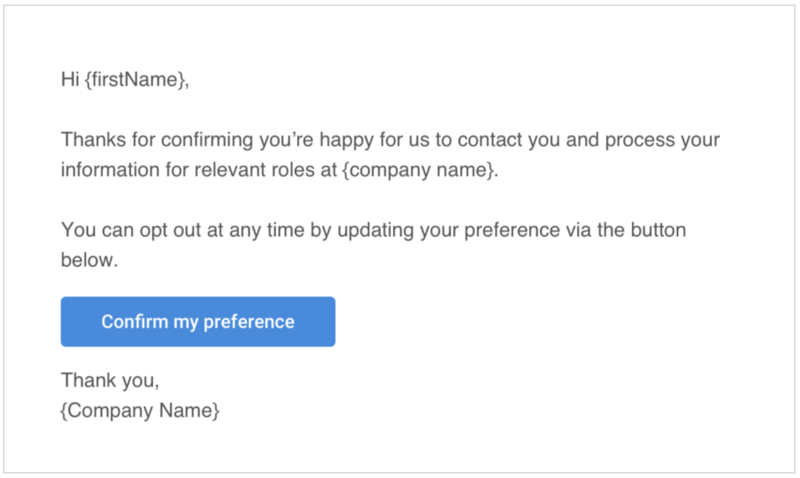 The GDPR opt-in is always required if visible on the form. 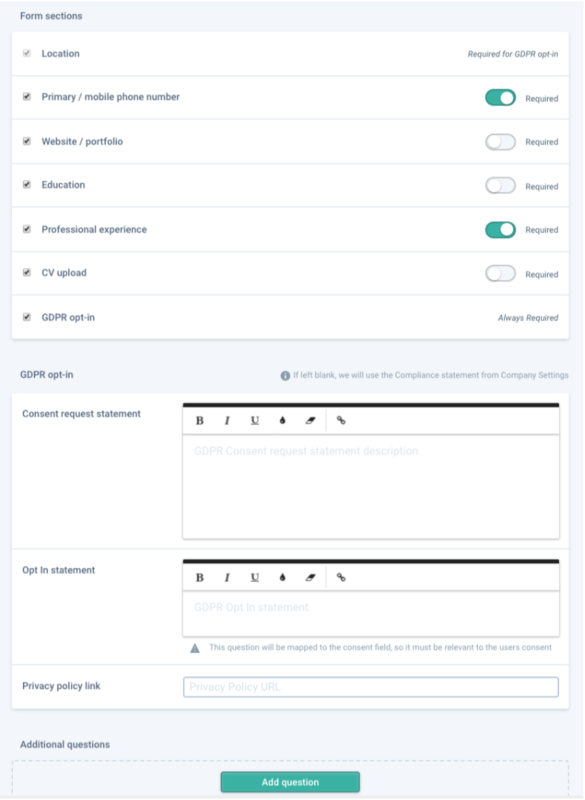 When the GDPR opt-in question is ticked, the location field will also become a required field (so that you can confirm if the candidate is from an EU country and collect this information in the database to later filter, track and manage consent). 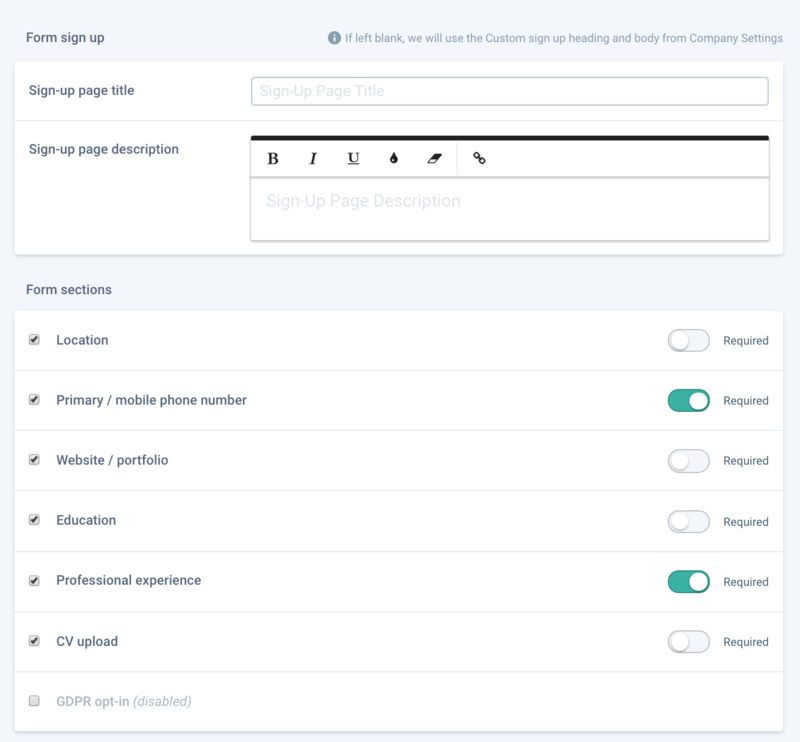 The candidate experience will remain consistent with the current experience, however some candidates will see fewer fields (depending on the form they complete) whilst some fields will be flagged as required with a ‘*’ symbol. Candidates will not be able to submit the form unless all required fields have been completed. If the candidate attempts to submit the form without filling in a required field, the unfilled field will be flagged as required. 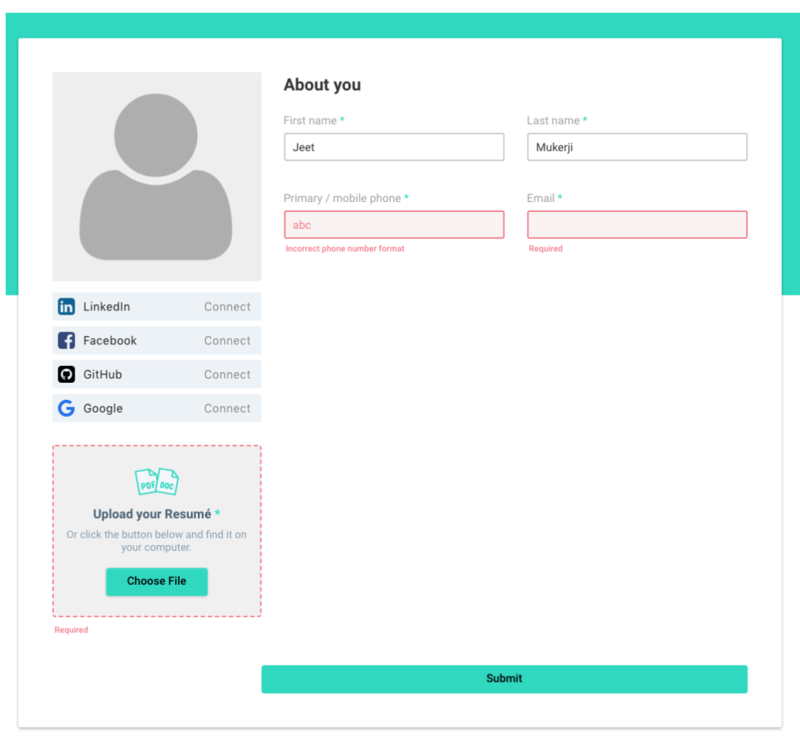 Below is an example showing an attempt to submit a form without filling in all visible fields (name, phone number, email and resume upload fields), and where the phone number is not in the correct format.